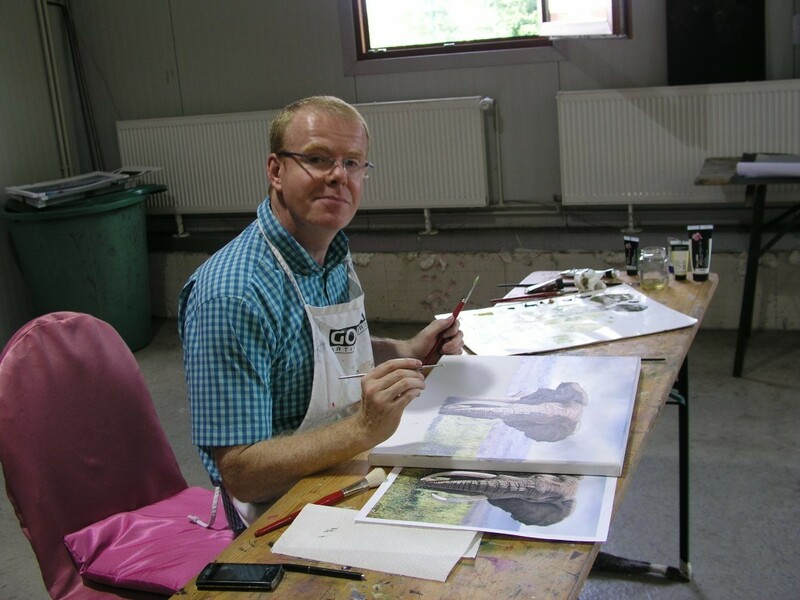 Eric Wilson is one of the world’s leading painters of Wildlife. He is particularly well known for his big cat paintings which are widely collected throughout the world and for which he has won many awards. A former Police Officer, Eric embarked upon his career as an Artist in 1990. Wildlife was his chosen subject, as it had been a lifelong passion. ‘You should always paint what you know and love best’ Eric feels, and for him the endangered wildlife of our planet was an obvious subject choice. Eric researches his subjects fully before painting them. Every animal he paints he first observes in the wild in it’s natural habitat. His adventurous research projects have taken him to the wildest, most remote regions on earth, from observing polar bears in the far frozen north, to tracking tigers in the jungles of Asia. Sitting with gorillas in Africa or sketching bald eagles on Vancouver Island. Eric’s first hand knowledge gives his paintings the authenticity that is much loved by his collectors. Eric has exhibited widely and with great success, from London and mainland Europe, to the United States. Christies in London have auctioned his work worldwide and he now has a firm collector base enabling him to deal mainly through his website, which allows him devote more time to painting and to the teaching of his painting techniques, for which he is in great demand. Eric has taught hundreds of students in his studio in Buxton, England, many coming from overseas even from as far away as Australia for his lessons. He also teaches courses continental Europe and Asia. So great has been the demand for his classes, that he has made two painting DVD’s which have now become international best sellers. Eric’s popular images have appeared in prints, calendars, magazines, jigsaw puzzles, cross stitch patterns, fabrics, fantasy playing cards and books such as ‘The Best of Wildlife Art’, ‘Keys to Painting Fur and Feathers’ by North Light Books and a book simply entitled ‘Tiger’ by Joanna Skipwith which is available at the National and Tate Gallery to raise funds for the conservation of tigers in the wild. Conservation of wildlife is of paramount importance to Eric. His many charity auctions have raised thousands of pounds for wildlife causes. Only once at the National Exhibition of Wildlife Art he helped to raise over £11,000 for wildlife charities. Eric is also an accomplished portrait artist who has twice painted the portrait of the super middleweight champion of the world, Mr Nigel Benn.